Double Board Certified Plastic and Cosmetic Surgeon, Dr. Ralph Bashioum, has been in practice for over 30 years, and provides each of his patients with quality and natural looking results. Whether you are seeking a breast enlargement, nose surgery, or tummy tuck you can be assured that you will receive quality work and dedication while in our care. If you have been considering cosmetic surgery, and would like a consultation please contact us at our Wayzata, MN office. A surgical consultation with us is very similar to a regular doctor appointment. So that we may provide you with optimal results, during your consultation we will ask your to fill out a medical history form. This allows us to better determine specific goals for you as your well-being is very important to us. 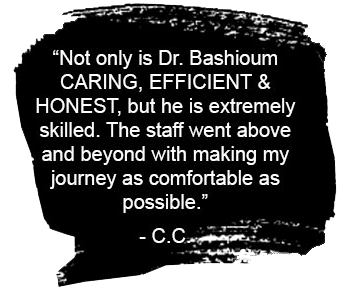 Dr. Bashioum will also visit with you and discuss your concerns and any questions you may have about your desired procedure. He will also examine you and provide his recommendation on how your goals can be achieved. We understand that choosing a surgeon is a very personal decision, and we believe that you need to be well-informed before you make any decisions. You may contact us by calling us at (952) 449-4900 or toll-free at (877) 647-6882. We look forward to meeting you and helping you in your decision!